Thicker, creamier and more tangy than more traditional yogurts, Greek yogurt has a strong flavor all by itself. But if you want to add a little extra flavor to your Greek yogurt, you'll find plenty of ways to do it. Just keep in mind that Greek yogurt may have more calcium and protein than regular yogurt, but it also has more fat and calories, so plan your snack accordingly. Give your yogurt a savory bite by stirring in roasted, mashed garlic, chopped fresh parsley and chives and sprinkling a few scallions on top, registered dietitian Cynthia Sass recommends in "Shape" magazine. Instead of a spoon, use cucumber slices or carrot sticks to scoop and eat your yogurt. Stir 1/2 tsp. of ground cinnamon into Greek yogurt for a sweet and spicy snack. In addition to adding flavor, stirring cinnamon into your yogurt may help boost your overall alertness and improve your cardiovascular health, Ann Kulze, physician in Mount Pleasant, S.C., and author of the book "Dr. Ann's 10-Step Diet" says in "Women's Health" magazine. 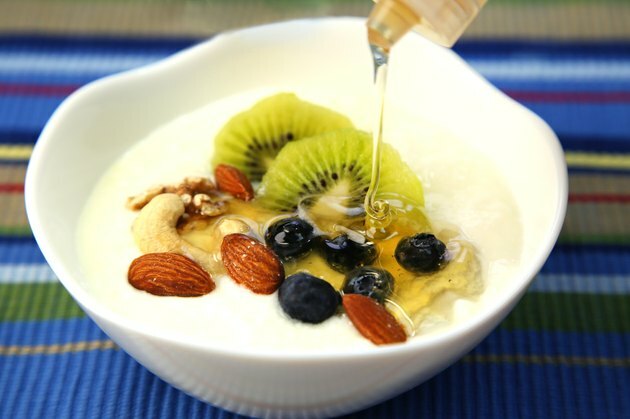 Sweeten up a serving of Greek yogurt by adding honey to taste, registered dietitian Dawn Jackson Blatner suggests in "Fitness" magazine. Honey may also help make the active bacteria in Greek yogurt work even better, promoting digestive health, Blatner says. Make a simple syrup -- mixing equal parts of sugar with water over low heat until they form a syrupy liquid -- with a halved vanilla bean, then stir the vanilla syrup into a serving of Greek yogurt to taste. Stir in a generous pour of orange juice to create a creamy orange flavor. If you have the time and inclination, this combination tastes good frozen as an ice pop, too. Add two spoonfuls of your favorite fruit jam to a serving of Greek yogurt and stir until completely combined. If you prefer, you can add chopped fresh fruit instead. Authentic Greek yogurt is strained -- that's what makes it so thick and creamy. Some Greek-style yogurts, however, get their thickness from added thickeners and stabilizers instead of straining, so check the label to be sure you know what you're getting. "Shape"; Healthy Foods to Satisfy Your Tart Tooth; Cynthia Sass, M.P.H., R.D.